Hydrolysed Collagen: The molecules of Hydrolysed Collagen are so minute that they can directly participate in repairing the skin tissues and keeping the skin healthy, radiant, and resilient. Lemon Verbena: A natural herb known for its amazing pharmacological actions in relieving inflammation, detoxifying the body, eliminating pathogenic heat, promoting diuresis, enhancing normal functions of the digestive system, and invigorating the liver. It strengthens cardiovascular functions to reduce the risk of heart diseases. Jasmine tea: It is incorporated to impart a refreshing taste, making it a revitalizing premix to blend with any non-carbonic drink, served hot or cold. 1. Collagen is known to be a form of protein. 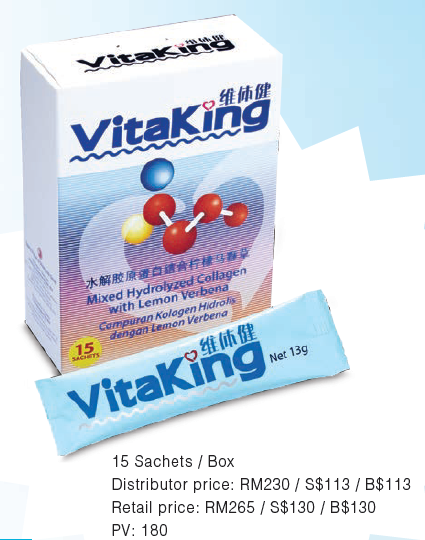 Since VitaKing is rich in Hydrolyzed Collagen, will its regular consumption bring about excessive burden to the kidneys? 2. Is VitaKing suitable for consumption by children below 12 years old? 3. Is VitaKing suitable for breast-feeding mothers or pregnant women? 4. Is it suitable for healthy people and those who do not suffer from pain in the joints? 5. How does VitaKing contribute to enhancing skin radiance? 6. Lemon Verbena is known to be a natural anti-inflammatory agent. Is this efficacy only limited to arthritis (inflammation in the joints)? Can it also benefit other forms of inflammation, such as an inflamed and swollen throat? We pledge to serve, to bring health and happiness to all. CEO Cafe - Your Choice of Top-Grade Quality & Peace of Mind!